My buddy Kevin Tunis is a woodworker with a flare for making high-end custom tables with rare and massive wood slab tops. 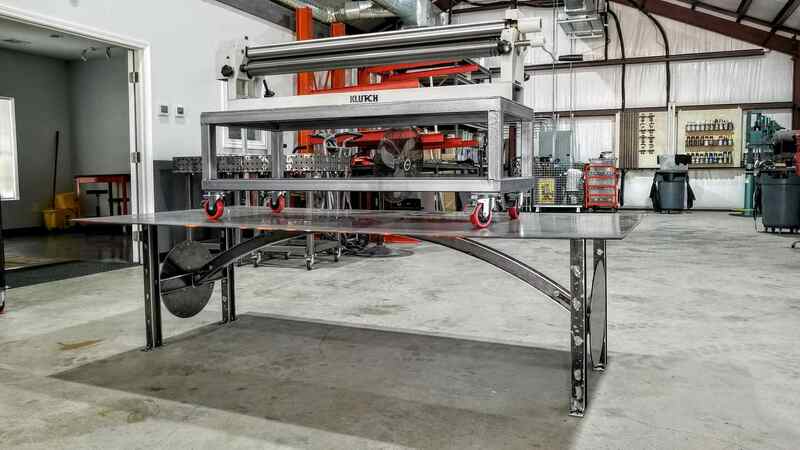 One such table is his Texas Elite which merges classical woodworking with custom metal fabrication for a table unlike anything you can get anywhere! Kevin loves to challenge convention, and the design of this table base is no exception. 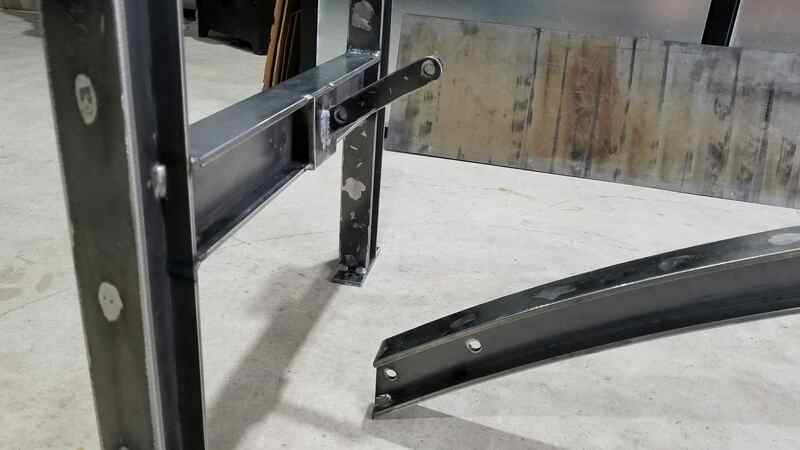 His vision was to build an industrial I-Beam design, including an arch in the center of the table that doubles as an additional support. On top of that, he wanted 2 inch I-beams – a size that simply isn’t made! The legs are actually the easy part (relatively). The parts for each of the legs and cross members were cut out and prepped for assembly. 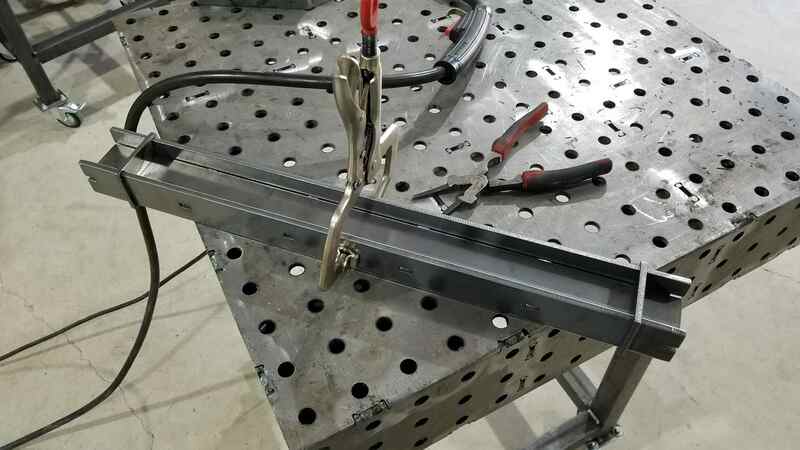 The tricky part was to ensure that all of the parts went together at exactly 90 degree angles, and that the center of the finished I-beam actually runs down the center between the two outer plates! 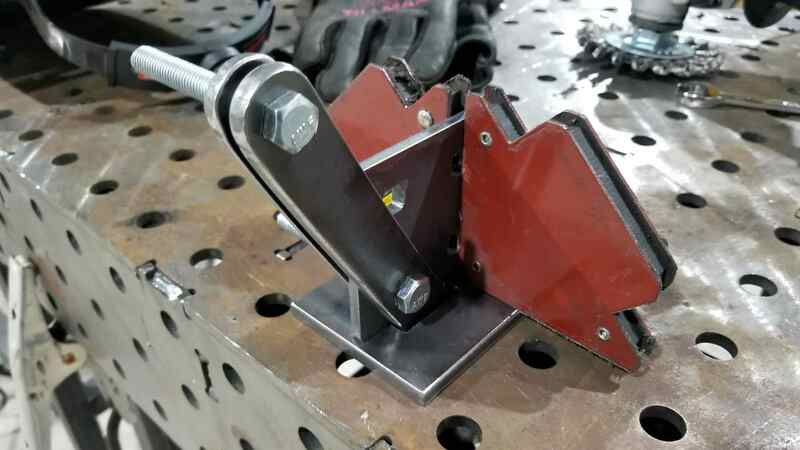 To accomplish that, I made some special jigs to slip the parts into to hold everything in perfect alignment while welding. If you noticed in the previous photo, the parts had square slots cut into them. 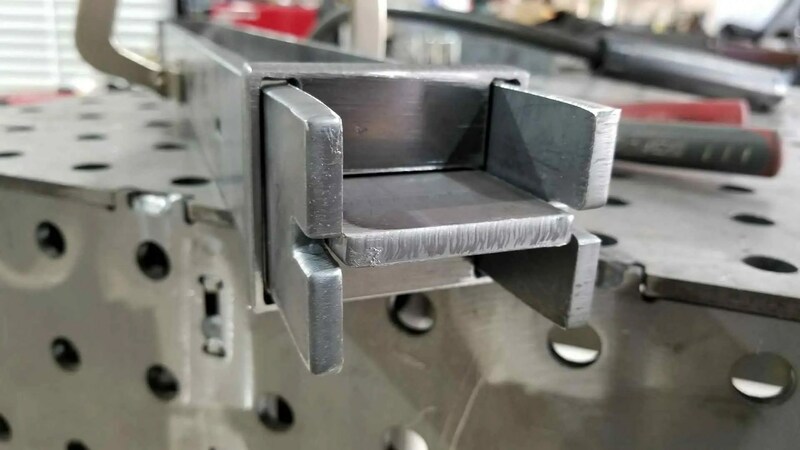 These slots allow the parts to be welded together, then the holes are filled with weld material which has to be ground flat. The first question that comes to most people’s minds is, “how do you bend that I beam”? The answer is simple – you don’t. 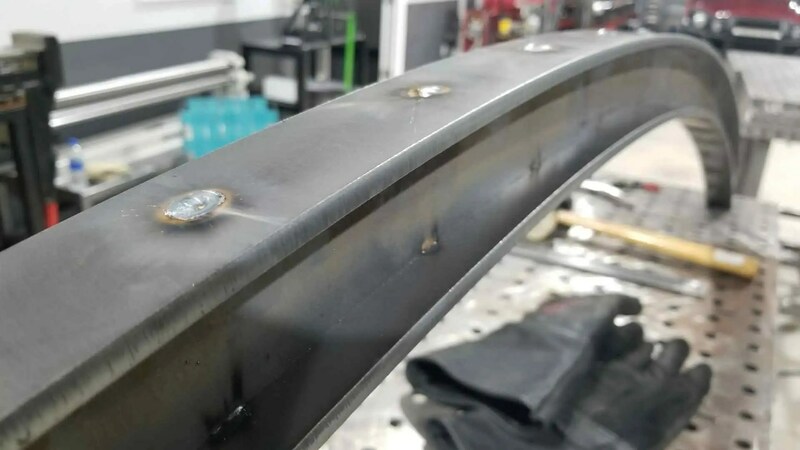 The very nature of the construction of I-beam’s means they can’t be bent without doing significant damage. The top and bottom plates would either tear or compress if you tried to bend it. 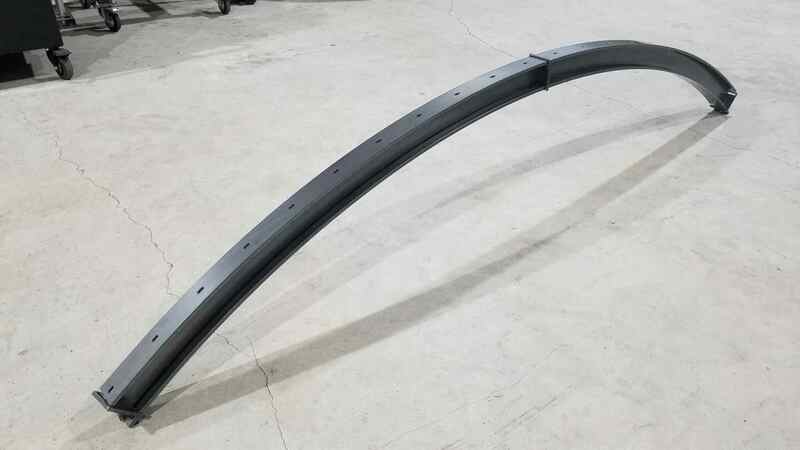 Instead, the only way to do it is to use a CNC machine to cut the center arch out, and then take the top and bottom support pieces and roll them through a plate roller to mimic the arch. 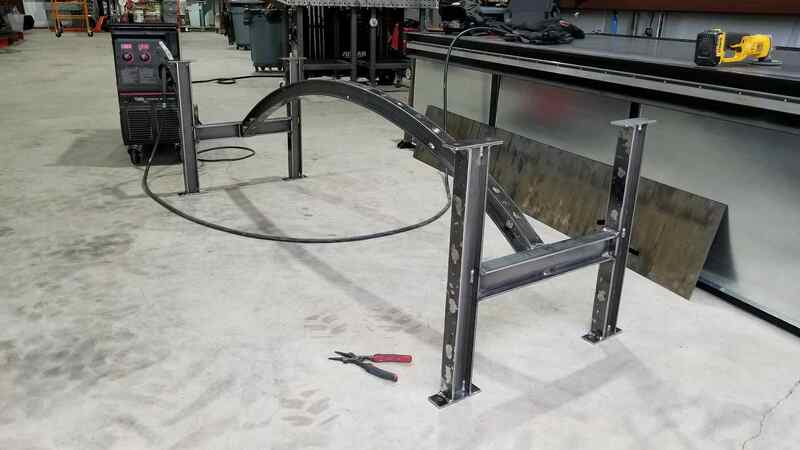 Just like the straight beams, the arch needs jigs to make sure everything is lined up prior to welding. 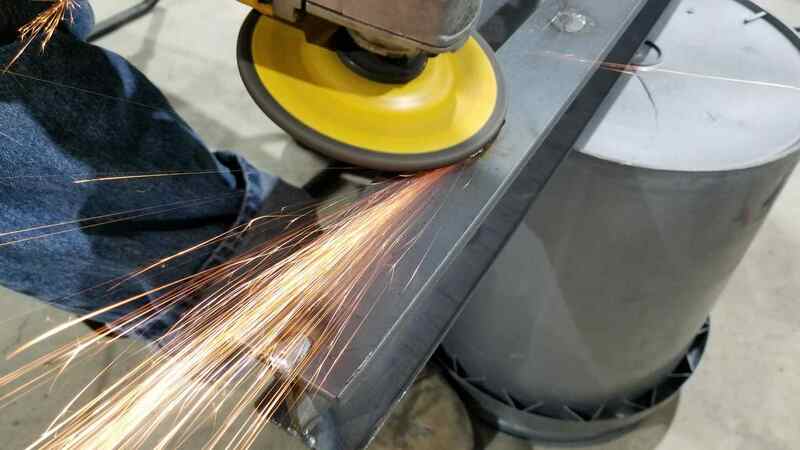 One of the goals was to make the table base appear old and worn, so I decided to weld every few inches. All in, there are over 50 welds on the top and bottom. Each of which had to be ground smooth. This is a huge table, and a correspondingly huge base. The legs are about seven feet apart, and lets not forget that once complete this thing is heavy! So it was imperative that the construction allow the table to be assembled and disassembled. This meant we had to find a easily connect the legs on either end to the arch in the center. 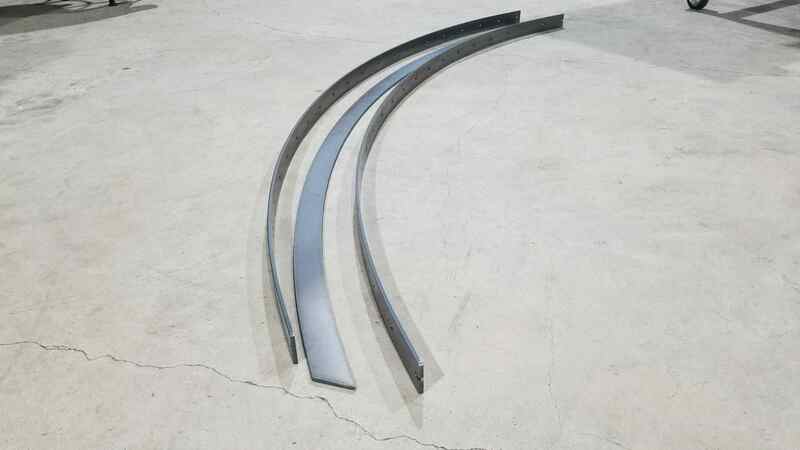 The answer was to create a curved mounting bracket which would allow the center section of the arch to slide into place and lock semi-permanently. 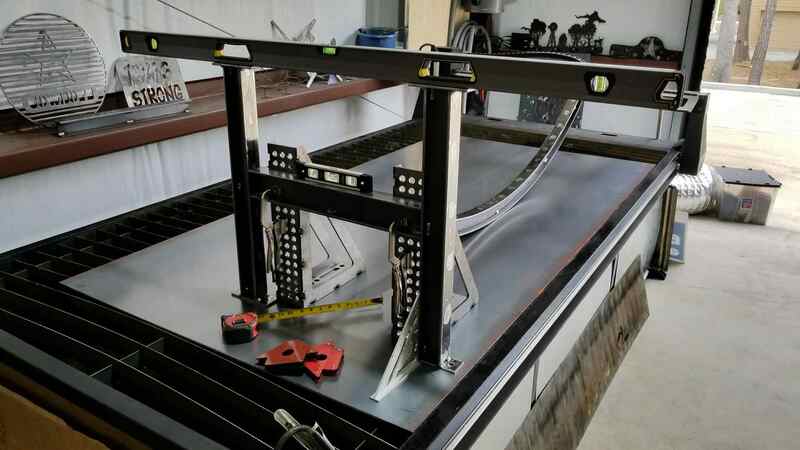 Here the parts for the mount are ready for welding. Once welded, you can see how the mount sticks out from the center of each end between the legs. And of course how the pieces all bolt together. 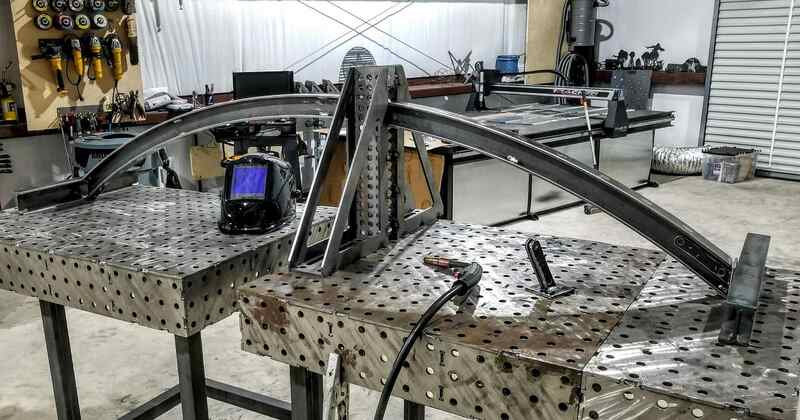 When it’s time to fit things together to ensure the center of the arch will support the table top, its as simple as turning the base upside down to make sure everything is touching the floor, then bolting it up for tightness. Once the legs and arch were all secured in place, it actually started to resemble a table! The final step (other than the whole process of creating the top!) was to add a pair of Texas Stars to either end of the table! 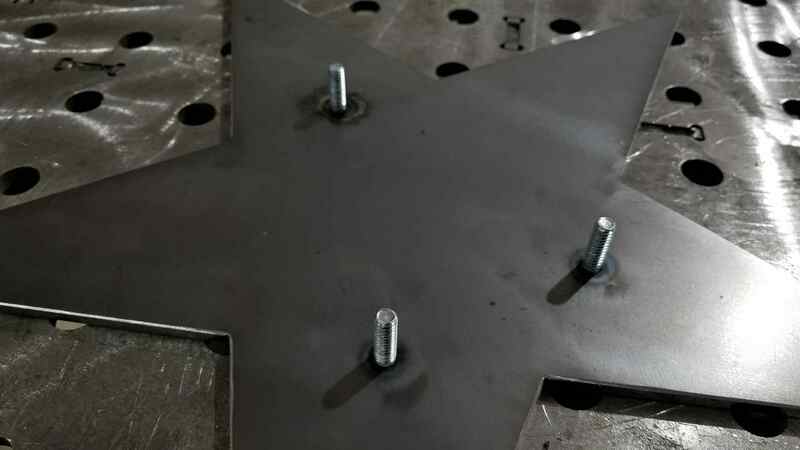 The stars themselves were made to be removable by welding posts onto the back that correspond with CNC cut holes in the round base plate attached to the legs. The stars were also painted a beautiful bronze color, and the base was hand treated with a beeswax based all natural formula to protect it from the elements! 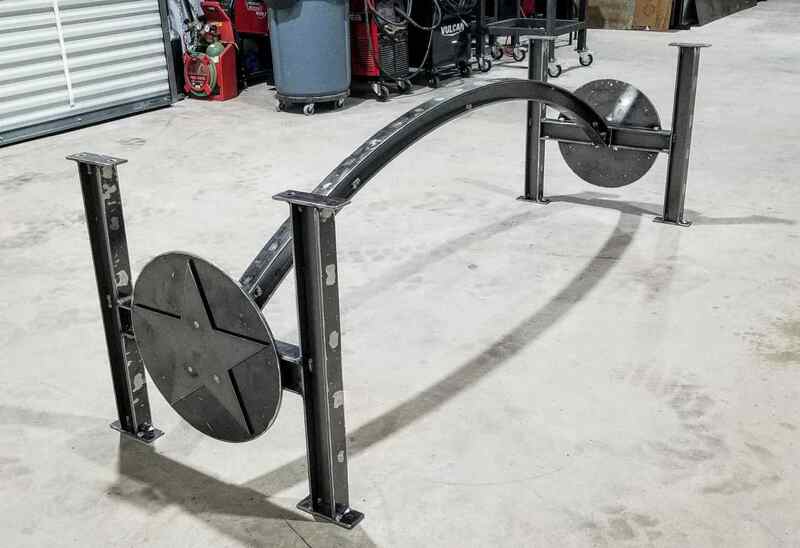 These bases can be made to accomodate any sort of top, and they are exceptionally strong! Prior to sending it out we loaded nearly 1,000 pounds on the base to stress test it, and it was solid as a rock. Next post: Turning the Johnson Service Group Logo into Wall Art!